AUGUSTA -- Madison Corgan, 10, loaded a blue-and-white piece of "quilt" into the arms of her team's robot, Sam, pushed a button or two and then watched, smiling widely but nervously, as the Lego robot went about the tasks the team had programmed it to do. AUGUSTA — Madison Corgan, 10, loaded a blue-and-white piece of “quilt” into the arms of her team’s robot, Sam, pushed a button or two and then watched, smiling widely but nervously, as the Lego robot went about the tasks the team had programmed it to do. Sam, a small, gray robot that gets around on tiny tank tracks, motored away from its home base, turned left, went directly to a waiting section of blue-and-white simulated quilt, and successfully deposited its payload of the matching quilt piece so it touched the rest of the quilt. Score one for the Cornerstone Bricklayers, a rookie team of youths from a homeschool group of the Cornerstone Community Church, of Winthrop. 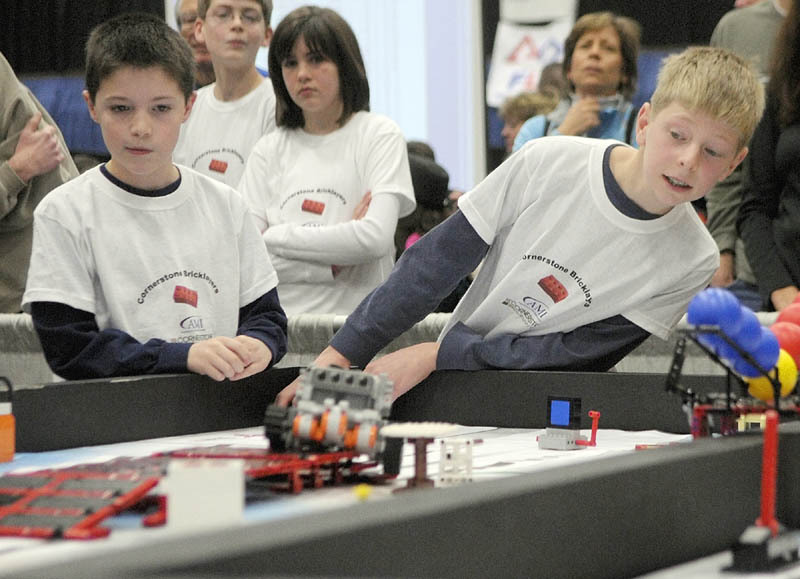 Madison was one of some 520 children who took part Saturday in the 13th annual Maine FIRST Lego League Championship at the Augusta Civic Center. This year’s theme, “Senior Solutions,” presented different kinds of challenges focused on solving problems people might have as they age. In addition to competing in designing, building and programming robots to simulate tasks, the participants, all ages 9 to 14, also interviewed senior citizens and set about coming up with a solutions to a problem they faced. The Albert S. Hall School team from Waterville, after interviewing a local senior, decided to work on a solution to unattended cooking, which team members said is the No. 1 cause of house fires. Their solution was Hector the Detector, a device that can be attached to a stove and is capable of sensing when a pot is on a burner, tracking its temperature and shutting off the stove if it gets too hot. 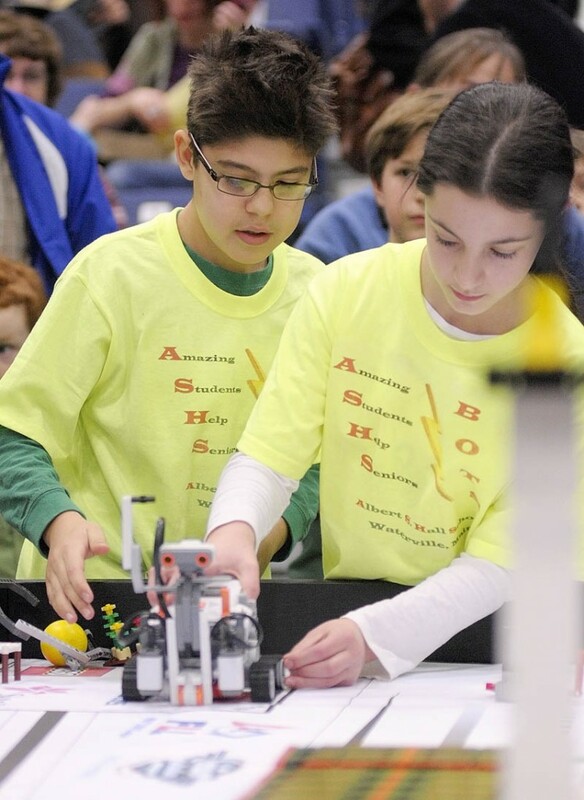 Teammates Alex Millones and Abigail Bloom took turns pushing the right buttons to direct the Albert S. Hall School team’s robot to pick up a Lego chair and return it to them so they could repair it, and then drive up a set of stairs onto an unstable platform and come to a stop. “I like trying to program it. Sometimes it’s a degree off and you have to tweak it and tweak it,” Alex said. The Waterville team received grant funding from a Colby College professor and Time Warner Cable to buy its robot and a related Lego kit. 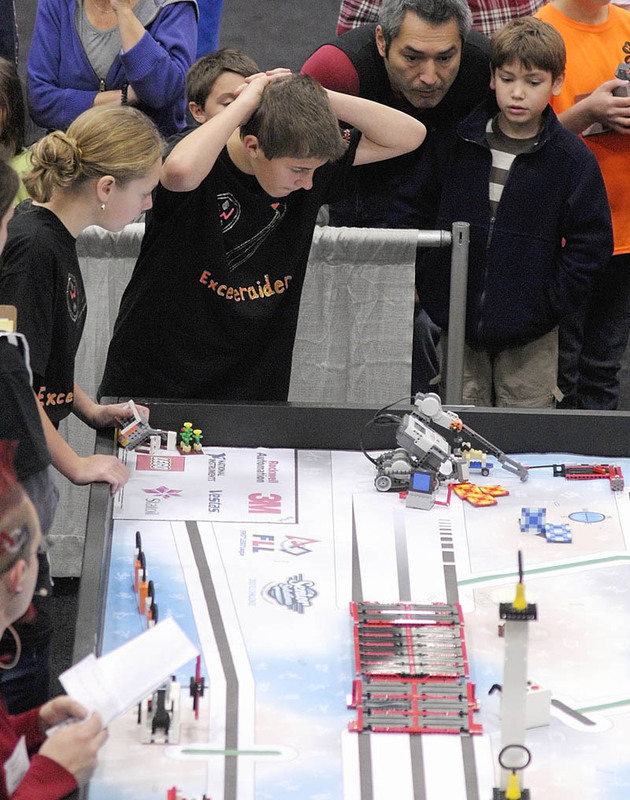 Fielding and equipping a FIRST Lego team can cost $450 to $880, according to Maine Robotics’ website. Parents of participants said it’s a great way to get children interested in science and problem-solving. Coach and teacher Laurette Darling said the robotics event has been on her “professional bucket list” for some time. She said the school had to hold a lottery to select the team because so many students wanted to take part. FIRST, or For Inspiration and Recognition of Science and Technology, is a nonprofit organization founded by inventor Dean Kamen and meant to interest young people in careers in science, technology, engineering and mathematics. 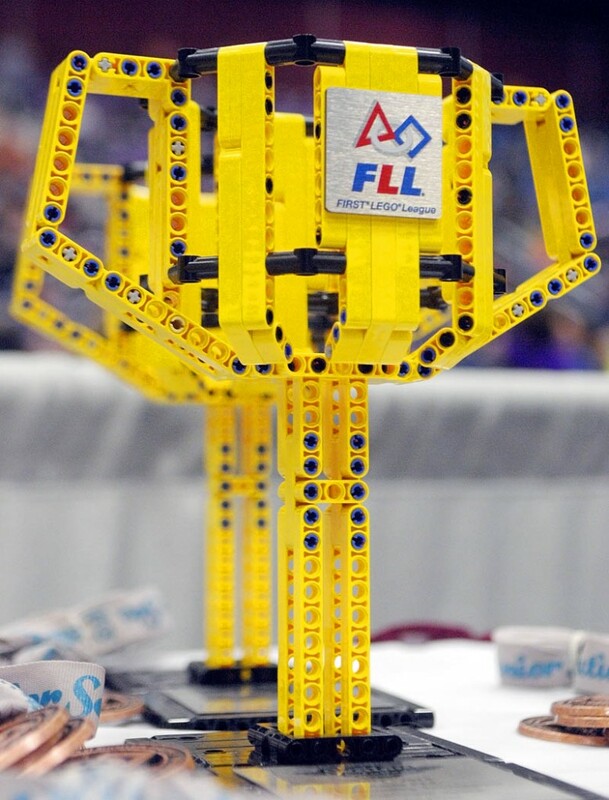 The annual Lego robotics competition, according to Ben Goff, program administrator for the nonprofit organization Maine Robotics, involved about 80 volunteers. Organizers said the daylong event is the state’s largest science and engineering education event.